We can get our cheap tickets for AVE Córdoba from thirteen different locations, always with the best offer available so you don't spend one penny more. Monuments, museums, courtyards, Arab baths, churches, mosques, wineries... In Córdoba we can enjoy of all this and much more at the best price for tickets AVE Cordoba. We have the cheapest train tickets AVE Madrid Córdoba, and also the best prices for the AVE tickets to Córdoba, there are 20 AVE trains that connect every day Madrid and Córdoba, from 08.00 until 20.35 in less than two hours of route. The price for these AVE Córdoba tickets are as low as 30 euros, a very good offer for the tickets AVE Córdoba. From the station Antequera Santana we can also travel with the best offers on tickets for AVE Córdoba, at schedules between 06.44 and 19.29, being 9 the AVEs Antequera Santa Ana Córdoba which leave every day and make the journey in just over half an hour. Barcelona is also linked to Córdoba at the best price with our tickets AVE Barcelona Córdoba, both direct AVEs to Córdoba and with transfers. The first journey is at 08.00, with transfer and it leaves us in Córdoba at 13.17, the second AVE travels direct between Barcelona and Córdoba and leaves at 08.30, arriving at 13.12, and the last AVE Barcelona Córdoba is at 17.00 with the AVE trains Barcelona Córdoba with transfer which depart at that time. Córdoba and Valencia are linked by a daily AVE, at 08.15 and that reaches Córdoba at 11.19, with a journey time of 3 hours and 4 minutes. And we have the most surprisingly low prices for these Cordoba AVE tickets from Valencia. We also have the AVE Tarragona Córdoba, with tickets AVE Tarragona Córdoba from 40 euros with 9 daily departures, between 08.33 and 17.32. The average travel time is of about 4 hours, depending on the schedule and whether or not it requires transfer. We can visit the famous Mosque of Córdoba also from Ciudad Real, for what we put at the disposal of our users the best prices in the tickets AVE Ciudad Real Córdoba, with departures between 09.51 and 21.27, in approximately one hour of journey. 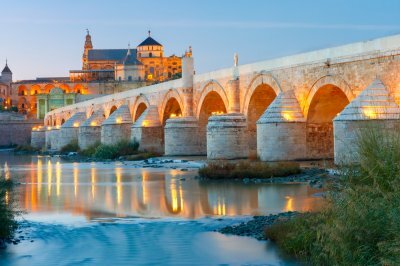 And to cross our country from south to north, we have the cheap tickets AVE Lleida Córdoba with 6 daily departures with the best deals, between 08.59 and 16.49. If they don't require transfer, the journey in AVE Lleida Córdoba is done in little more than three and a half hours. To visit the Tower of Calahorra, the Alcázar de los Reyes Cristianos and many other things from Málaga is also possible and cheap if we do it with our tickets AVE Málaga Córdoba, having 13 departures between 08.00 and 21.20 and we arrive to Córdoba by the AVE in less than an hour. To enjoy the Calleja de las Flores, Plaza Corredera and Plaza Tendillas travelling from Zaragoza to Córdoba is viable and cheap with the tickets AVE Zaragoza Córdoba that offers you our search engine, with 15 direct AVEs Zaragoza Córdoba and with the best offers. The first departure time is at 08.45 and the last one is at 19.45 and the time to cover the distance between Zaragoza and Córdoba by AVE is just over 40 minutes. But the connections in AVE to Córdoba are not finished here, we also have the best prices on AVE Puente Genil Córdoba tickets, AVE Sevilla Córdoba tickets and AVE Puertollano Córdoba tickets. The AVE will transport you from different parts of Spain to one of the most beautiful cities in the country. In it, Jews, Muslims and Christians lived in harmony and it was already in the XIth century a very cultural and high-educated city. Strolling through its narrow streets and visiting the Mosque of Córdoba are two of the things that make worth traveling to Córdoba. Spain has such an extensive network of high-speed trains! Some of the lines that stop in Córdoba are the following: The line Madrid - Sevilla stops in Ciudad Real, Puertollano and Córdoba, until arriving at Sevilla. Another popular line is that of Barcelona - Sevilla, which stops in Camp de Tarragona, Lleida, Zaragoza, Ciudad Real, Puertollano, Córdoba and finally Sevilla. Others are Valencia - Sevilla, Madrid - Málaga and Barcelona - Málaga. The AVE station of Córdoba is the main station of this city and it is only 2 kilometres from the city, next to the intercity bus station. During its construction some archaeological remains were found but unfortunately, they were partly destroyed because of the works and the old station of Córdoba stopped being used as a railway station. The current station is modern and has all kinds of services. In addition, it is very well connected with the rest of the city. It is located in the Plaza de las Tres Culturas. The new station began to be projected in 1986 when it was wanted to build the New Rail Access to Andalusia (NAFA) in international gauge to make the circulation of the trains of the future possible, the high speed trains. It contains routes of international gauge and also of Iberian gauge, for the services of Media Distancia and Larga Distancia. In Córdoba you will be able to enjoy some lovely days. This city offers a lot of cultural visits.